The Godfather is one of the best American movies ever made. It is a touchstone of the cinema being one of the most widely imitated, quoted and lampooned movies of all times. The movie is based on the book of Mario Puzzo:” The Godfather” wich is pulpier than the movie but, it does manage to express the power of the novel on which is based on. Realizing that the section two of the book will not fit into the movie Copola decided to incorporate it in part II of the film. Mario Rezzo was the cowriter with Copolla for the screenplay. Francis Ford Copola deserves all the praise and awards this film have received over the years. Copola assembled a superb cast but also a talented crew. His main character Al Pacino and Brandon Marlo were the best choises he could have for the roles of Vito Corleone and Michael. The film accentuates the importance of the family both biologicall and professional. This type of movie is very indicative of the times it was filmed for. The slow pace, the episodic nature, the over the top violence, none of them will warrant the classic status movie in the present day. 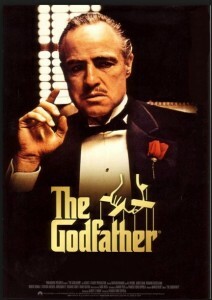 And let’s not forget that The Godfather is the movie that started all the modern mith of the mafia. Movies like Goodfellas and Sopranos would not exist without Don Corleone. The caracters are mobsters, murderers, thieves, and yet the audience falls in love with them because Copola captured the beauty of Puzo’s novel in a magical and innovative way going beyond the pages of the book to imagine the cast members and the caracters. The movie is following a families life over the generation in their parlance of organized crime. The main character Vito Corleone played by Marlon Brando and Michael Corleone, Vito’s youngest sun live in 1940’s New York, and they are the heads of the Mafia family. Although Marlon Brando is considered the main actor in the Godfather movie and won the Academy Award for the best actor for his performance, Al Pacino, who playes the role of Michael Corleone has way more screen time. Michael, who defied his father by enlisting in the Marines to fight World War II, is now returning home as a war hero to attend his sister’s wedding. His sister Connie is played By Talia Shire. He attends to the wedding accompanied by his girlfriend Kay, who is not an Italian but who will find out about “the family business.” at the wedding even dough Michael is rejecting it so hard. The high stake heroin dealer Solozzo, wants to use the Mafia Families to sell his illegal drugs. He convimcez the other 5 mafia families in New York but can’t convince Don Corleone to play his game. He needs the Corleone family because of their political and law-enformercement conections. Even if Don Corleone rejects Solozzo’s offer, Sony his oldest sun makes the mistake of letting Solozo know that there is slight ambivalence in the family about getting in to drugs. Because of this Vito Corleone becomes a target that Sollozzo that the family will reconsider his offer hopping that the family will accomplish its starting a war among the five New Yoek families. A few months later when his father is shot by a gunmen employed by his rival and barely survives to a second assasination attempt, he wants to have his revenge on the man responsible for trying to kill his father. He convinces his brother Sony, played by James Coan and the family advisor Tom Hagen, played by Robert Duval and Sal Tessio played by Abe Vigada, that he is the right men for the job. He does what he promised by murdering the drug trafficar and a corrupt police captain, but he starts a gang war. Once Michael kills Sollozzo and McClensky, his destiny is assured. He no longer choses to stay out of the family business. It is interesting to see Michaels gradually development from the little brother he is in the family to a war heroe and then to a ruthlessly efficient Don. To escape from the war he started, he runs and hides in Siccilly. Here he fals in love with a local girl. Michael marries her, but the marriage won’t last because she is killed latter by one of Michels enemy in an atempt on Michaels life. The cast couldn’t be better. The on location sicilian actors selected for the portion filmed on the sicilian island were the best choices that Copola could take. Don Vito’s Corleone’s character seems melancolic and rueful, mouring his situation in life. The way that he chosed to live his life but in the same time accepting his reality and responsibility that comes with his position. Sonny, Michaels older brother, is also killed. Being betrayed by his sister Conie’s husband. Returned home Michael askes his ex-girlifriend, Kay, to marry him while his father recovers and makes peace with his enemy realizing that another powerfull Don is behind the gang war. Once Michael is named the new don he takes the family to a new age of prosperity, then lanches a new war against the people who tried to eliminate his father and his family, consolidating his power.